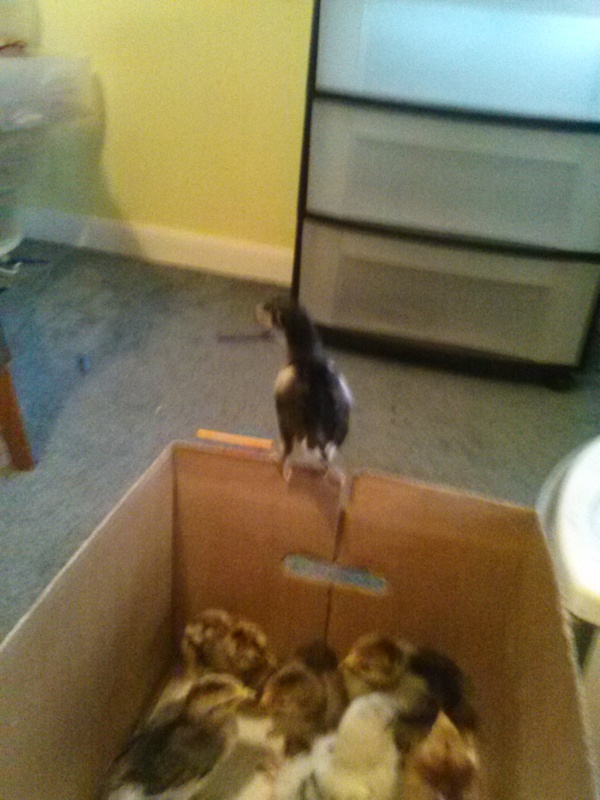 My newest batch of chicks are now almost 2 weeks old. They’re doing really well. 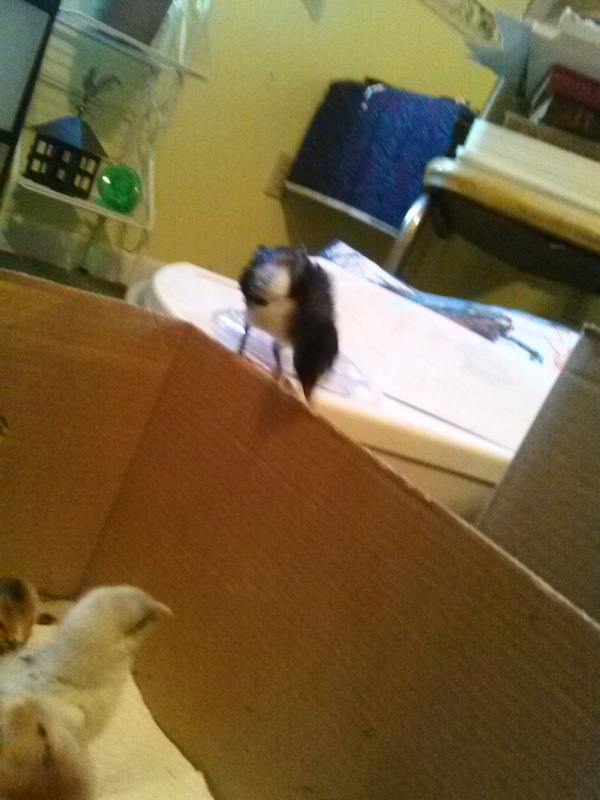 I change their bedding each day (I use paper towels), and when I do, I move everyone to a different box while I clean up their brooder box. 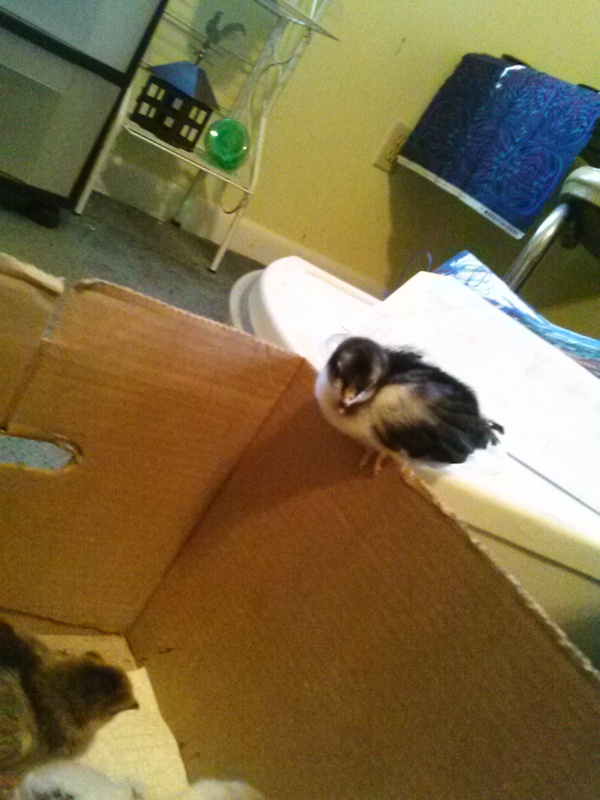 Earlier this week, when they were just over 1 week old, I had put them into the other box to change the bedding, and suddenly one popped up onto the edge of the box and perched. I have never seen a chick this young do this. Granted, I have not been raising chickens that long, but this is my third batch of chicks and I didn’t think it was possible for any to get out this early. It’s a paper-ream box, so it’s a good 10 inches tall. 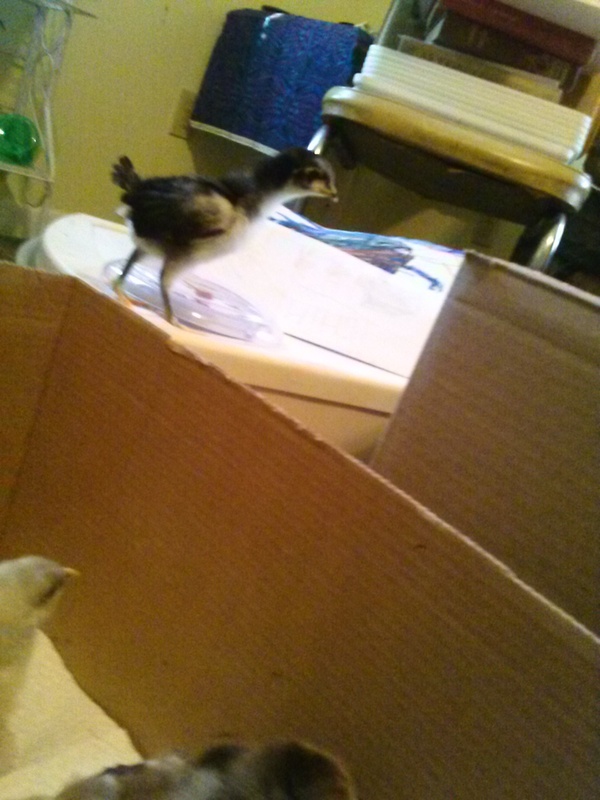 The chick perched on the edge, and then wandered over to a little plastic drawer that is set up next to the boxes, and then to the floor – he wandered around outside the boxes until I was done setting their brooder box back up. 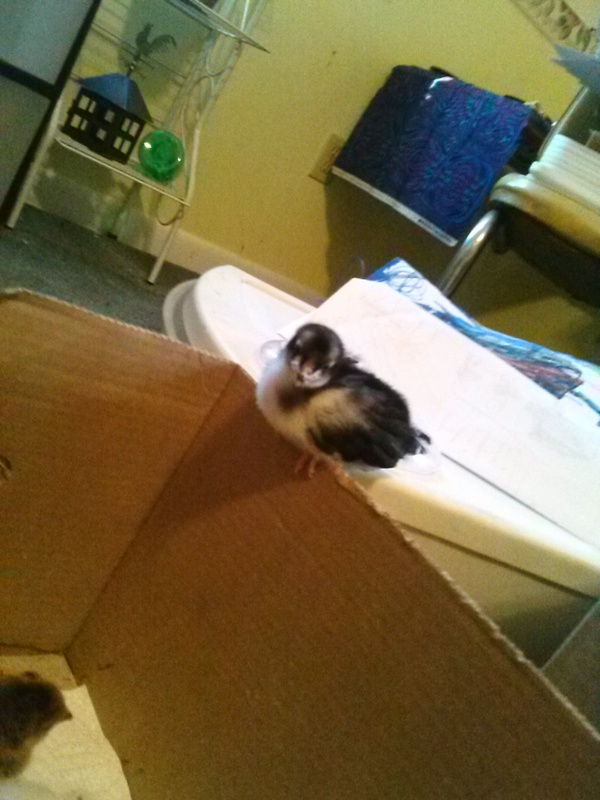 I started to put the other chicks back – he saw this and jumped back up onto the drawer, and then into the brooder box. So I didn’t have to put him back at all. This batch and my last batch were “mixed rare breeds” orders. 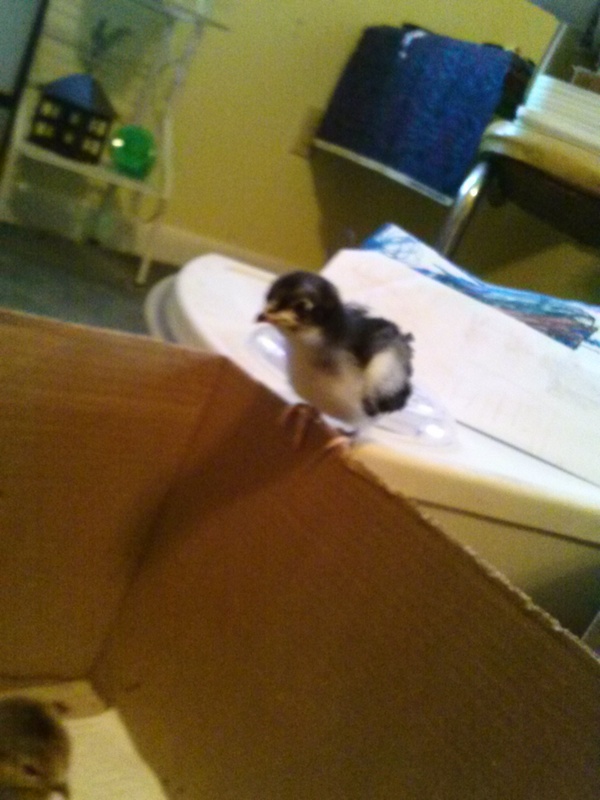 This means I am still trying to figure out what kinds of chickens I have – it’s fun to try to figure it out. I have been hoping for a Black Sumatra, which is one possible kind they could ship with my order. I was wondering about this one, because I saw pictures of Black Sumatra chicks and they look like little penguins, like this guy. Black & white. 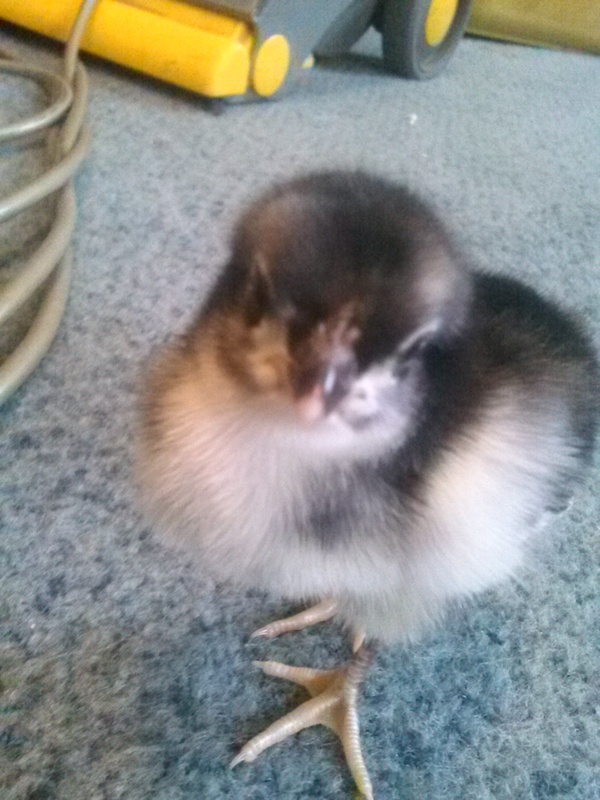 But other breeds’ chicks can look very similar, so it’s really hard to tell at this stage. Once I found out this one can hop out of the box, I did some reading and found that other people with Sumatras have had them jump out of the brooder at this age, and as adults they can jump 6 feet. They also like to roost in trees. So it’s very possible that this is a Black Sumatra. Time will tell. Below is a series of pictures of one of his escapes this week – some of the pics are not the best because I was taking them quickly as he moved, trying to get the best picture.